In order to attend the Best Buddies Leadership Conference (BBLC), many attendees will need to fundraise travel costs. The first step in raising the funds for BBLC, is to determine how much money you need. Research how much a flight will cost to BBLC and add your conference fee, if you are responsible for paying one. 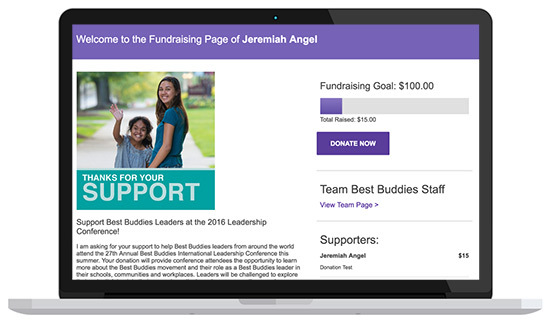 To assist with your fundraising efforts, Best Buddies provides you with an easy to use personalized donation website. Follow these steps to raise funds for your attendance at Best Buddies Leadership Conference. You will be surprised at how many people you know and what a resource they can be in the fundraising process. People are especially understanding of fundraising efforts these days, particularly when it is for such a great cause like attending the Best Buddies leadership conference. Below are some examples of individuals who may want to support your efforts. Family: Your parents, grandparents, siblings, extended family and even your own children. Friends and Associates: Your friends, co-workers, neighbors, PTA, religious groups, alumni groups, etc. Businesses You Patronize: Your doctors office, dry cleaners, stores and restaurants in which you frequent, etc. Your Lists: Your holiday card list, address book, club lists, chamber lists, professional group lists. What makes the solicitation letter so successful is how little time it takes to send a good deal of information to a large amount of people. With every letter you mail, you should include a pledge form with your fundraiser information on it and a return envelope. Below are some tips on fundraising via letter-writing. Set a Deadline: People are generally motivated by deadlines. Use a date that is at least a month in advance of the actual deadline. This is a good way for you to assess your progress before it is too late. Explain the Donation Process: Be sure to give step by step directions on the donation process. Track Your Letters: This will not only help you send follow-up notes but it will also come in handy when you send out your thank you notes after the event. To assist you in your e-mail fundraising campaign, we highly recommend that you create a BBLC online fundraising website. The website is a great tool to help you raise your travel costs or registration fees for BBLC. The website allows you to personalize your own fundraising page, send donation requests to family and friends, manage your funds and send thank you letters once you’ve reached your goal. By utilizing this service you’re also providing alternate donation options to your donors such as an online credit card form and a personalized tax receipt. Please note: any extra monies raised through BBLC Online Fundraising will be used to support Best Buddies in your state or country. No funds will be carried over to cover costs for future conferences. Encourage your members to conduct chapter fundraisers as a way to raise money for the conference. Here are some great ideas to give you a head start. Remember to be creative! Have a Raffle: Enlist the help of some friends and hit your community to get prizes donated. These prizes can be anything from clothing, artwork, and spa treatments to dinner, movie passes or tickets to sporting events. Casual Days: Ask your school principal to agree to a casual day for everyone who donates a certain amount of money. Gift Matching: Ask the company where you or your parents work if they match money given to nonprofit organizations or charities. If they do, the company doubles what each co-worker personally donates, making your process even that much easier. Also have your donors ask if their companies do. Each company is different on how often they cut checks. Make it a Family Effort: This is a great family project to get your family involved in your efforts. Include your parents and siblings in raising donations for BBLC.